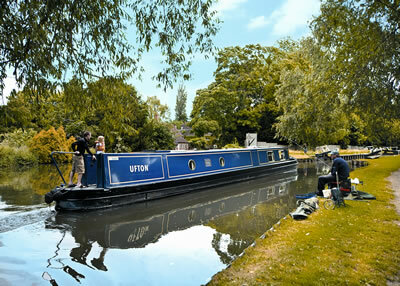 Reading Marine canal boat, narrowboat and barge holidays on the Kennet and Avon Canal. Barge, canal boat and narrowboat holidays with Reading Marine can give you one of the most enjoyable and enchanting holidays you’ll ever experience. Traditional boating holidays are becoming more and more popular as holiday-makers rediscover the joys in cruising Britain’s inland waterways. We offer weekly, short break and day boat hire. The canals are a haven of peace and tranquility. Here you can escape the hustle and bustle of twenty first century demands - no telephones, no traffic-jams, no rushing about, no watching the clock. Instead relax at a nineteenth century pace as you see life gradually reveal its many natural delights. So, ‘Welcome Aboard’ to Reading Marine. We hope you will decide to stay with us, for we know you will have chosen a holiday that’s so different and so rewarding.